....only it's way more spread out and diffuse- I would need a wide angle lens to fit it all in and that just isn't in the budget! So this blog is a place where I try to be open and honest, and give you a bit of a glimpse inside our lives. I think that it is important to share ideas and insights, and help people where and whenever I can. It's also a place for me to admit to my many parenting mistakes. I don't so much like admitting to them I'd far rather just sweep them under the carpet and pretend they don't exist. But they do. In multitudes. Parenting is a learning process and it doesn't always come easily. Even if we had instruction booklets for each kid we wouldn't have the time to read them, would we? 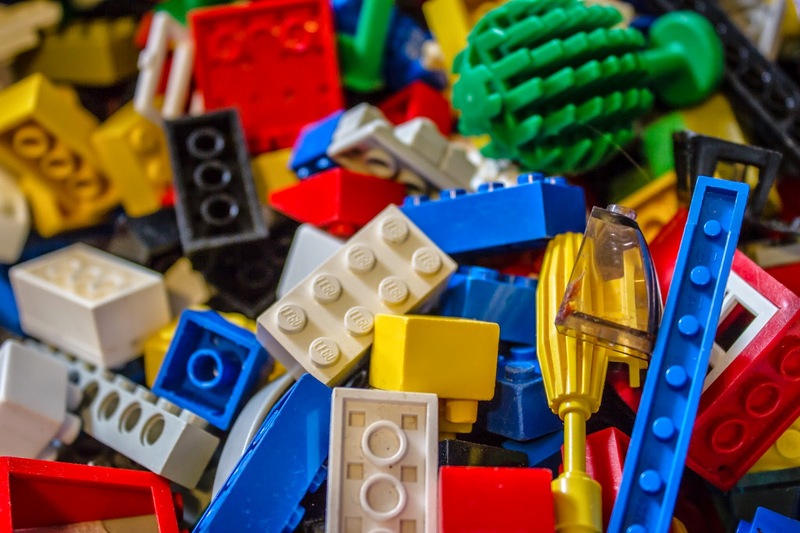 You are probably wondering how Lego, occupational therapy and fine motor skills somehow add up to a parenting mistake, aren't you? A long time ago in therapy (Owen was about 5 at the time) he was given the task of assembling a car by reading the instructions in little manual. He had a terribly difficult time with it but he kept at it- of course the end result wasn't exactly what was pictured. The therapist was gently suggesting that it was a skill he may never develop. At the time it bothered me immensely because I knew that he really wasn't a "car" type kid- we've got hundreds of them laying around because cars are one of my stepson's favourite things in the world. Owen has always been more interested in "people" toys. One of his first favourite games was to use spoons as characters- even before he was verbal he would put them face to face and make interesting intonations with his voice. 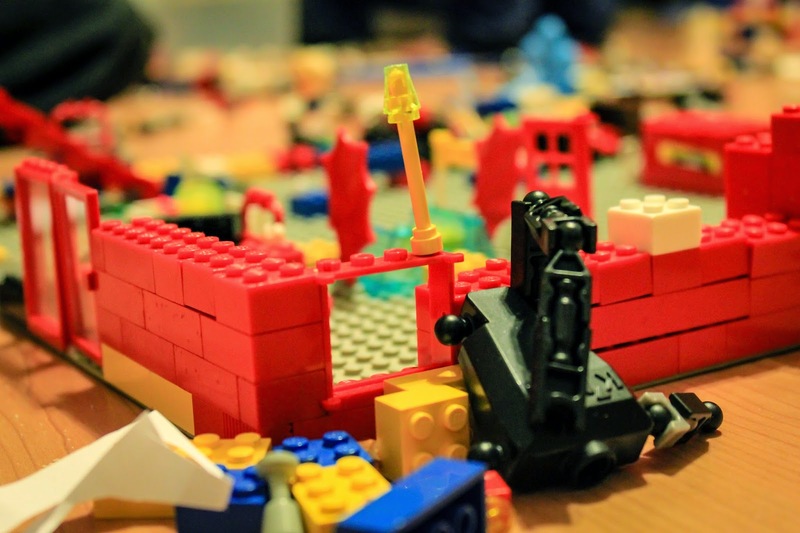 But thinking that maybe he needed some extreme help in the area of putting together Lego cars we set to work on practising that skill. Perhaps not one of my finer moments. Oy. So what I learned through this process is something I already knew, but sort of ignored in a moment of weakness- we learn better and far faster if we have passion in the subject. Our imaginations and brain capacities ARE NOT LIMITED if we are provided with opportunity. And we don't all follow the same path. 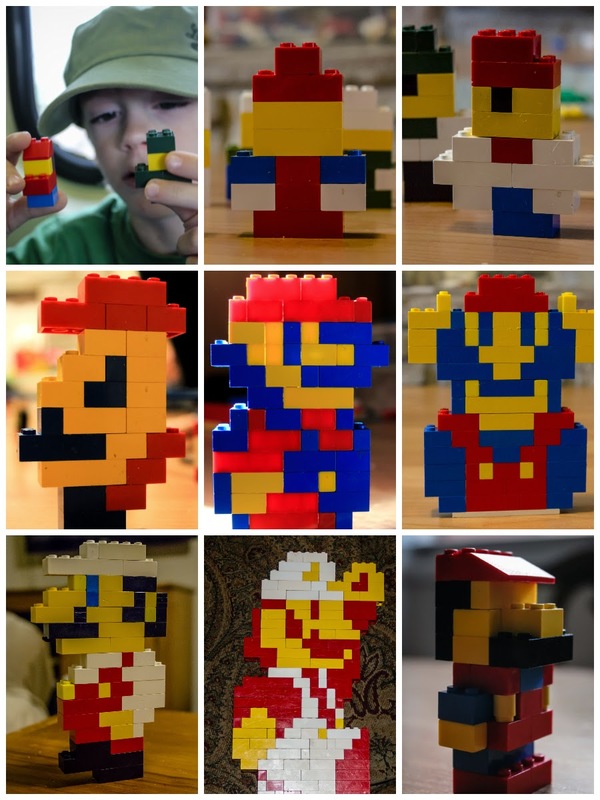 For Owen, (since he loves computers and Mario to the moon and back) we first introduced the larger concept of pixels. Oh my Heavens the boy thinks in PIXELS! Then he spent a lot of time reading about all of the different inceptions of Mario over the years. 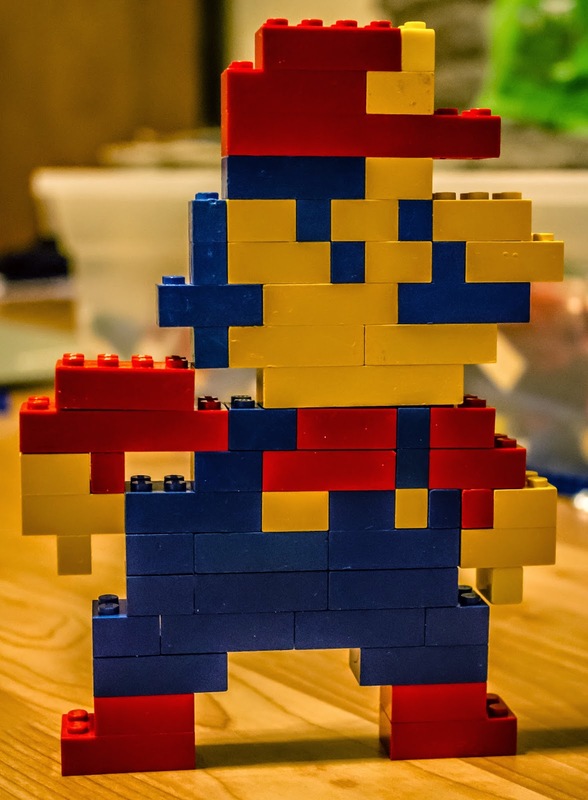 He can not only build them, but he can tell you which one is which. 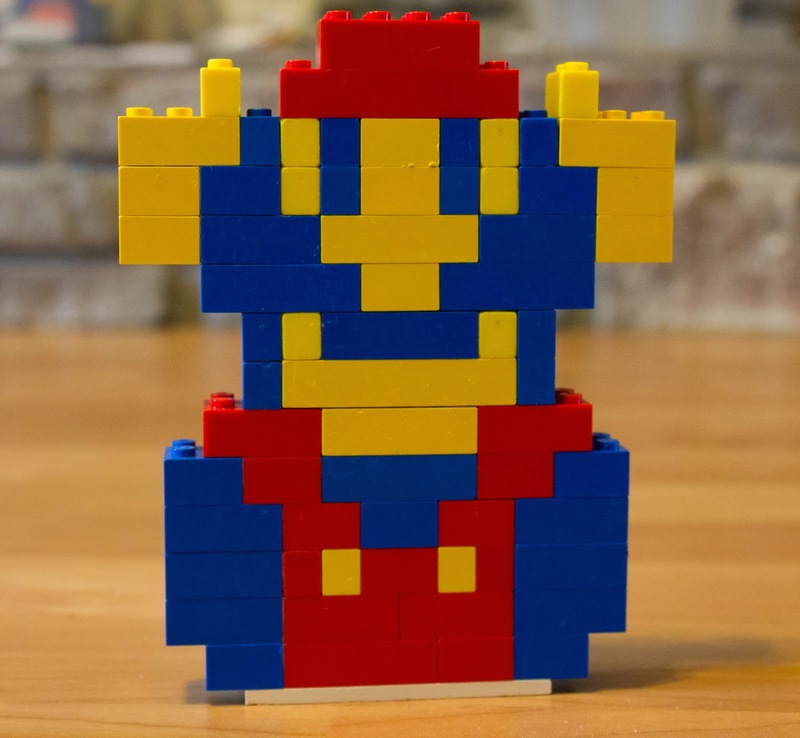 I had NO IDEA that 8-bit Mario looked different than 32 bit Mario and I am still struggling to grasp who is who! The picture below should give you a good idea of just how many Mario's we've seen over the last 2 years. I haven't taken a picture of every single one I just don't have the space on the hard drive! This post is part of #TherapyThursday, which I hope gives you a glimpse inside our lives. Care to join me in raising awareness of Special Needs? Post a blog, picture or tweet about it using the hashtag #TherapyThursday. Feel free to post a link below in the comment section! Remember that there are many different types of therapy- Occupational, Physical, Feeding, Speech Language and Behavioural to name a few. I hope it will serve as yet another way to spread awareness of special needs! 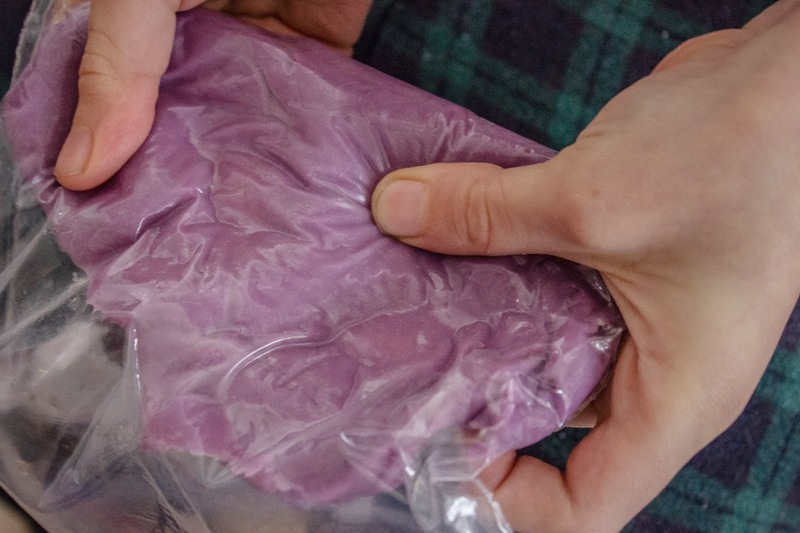 Whether you call it play dough, therapy putty, modelling clay or play clay it is a whole lot of fun to play with, and pretty easy (not to mention cheaper) to make at home. We have spent the last few months experimenting in the kitchen with different recipes and I thought it might be a good idea to share the results. Play dough is a really versatile occupational therapy tool at Casa Sprung. Because of the malleable nature of the clay it is an excellent tool for stretching the tendons and strengthening all of the muscles in the hands, helping prepare them for better fine motor skills. Fine motor activities include anything that requires the strength, coordination and precise movements of the hand muscles- so think hand writing, using scissors (or utensils, tools of any type really), zippers, tying shoes, manipulating small objects (think Lego- I'll post next week about that)- things that require precise motor movement to complete and often delicate task. Both of my boys have difficulty with fine motor skills, but for slightly different reasons. Did you notice the super bend-y fingers in the photo above? They bend both ways- forward AND backwards. 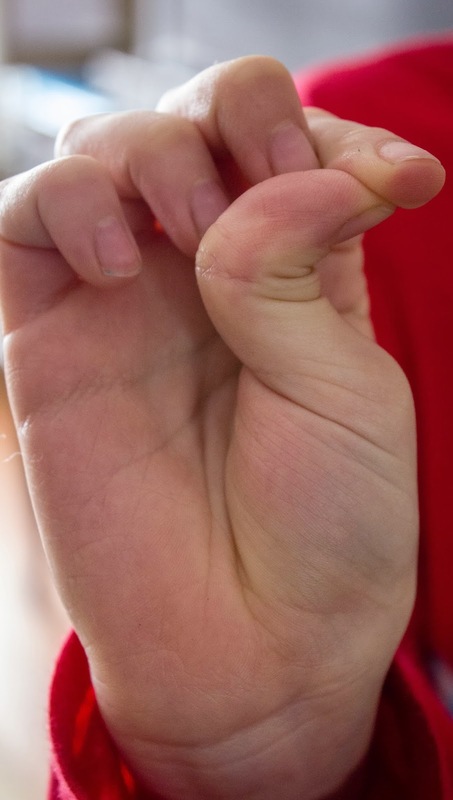 The oldest has "hypermobile joints" which means that his joints bend much farther than normal. Unfortunately, this can cause a lot of additional stress on the joints. Fatigue is common (other muscles have to work very hard to compensate for the joint instability) and it's difficult to complete tasks because of it. At Christmas we bought the Littles some scented play dough thinking that it may be a fun way to focus a bit on fine motor tasks. It turned out to be the favourite gift- they ALL played with it for hours, big brother included. The only trouble was that Daisy wanted everything to dry so she could keep it- and I quickly realised that it was going to be expensive to keep them in play dough. I also noted that unless I bought the really expensive therapeutic putty I couldn't really purchase different dough consistencies. Therapy putties typically come in varying degrees of soft, from extra soft to firm. NOT cheap. So we "kitchen hacked" a number of popular recipes to see what we could come up with. was very soft and light. We liked it, but it tended to make our hands feel a little dried out. The recipe we used can be found here. Flour Dough (uncooked method) was a little firmer in consistency. It doesn't exactly feel like commercial dough but it's fairly close. It did leave a really weird film on our hands but even my sensory boy kept on trucking. You can find the recipe we used here. Probably my favourite dough was Jello based. Yes, this added to the cost but not only was it a pretty colour it smelled like grapes and my hands felt GREAT afterwards. You can find the recipe we used here. Note- I used coconut oil in the recipe and I think that is what I will be adding to play dough from now on. Consistency was very similar to regular store bought dough. To increase the resistance of any of the doughs (or to help sensory avoiding kiddo's) you can place the dough inside a heavy-duty-plastic-zipper-top-freezer-bag (I'm pretty sure that is breaking every single grammar rule on the planet but I don't want to name drop) and have them squish the heck out of it. 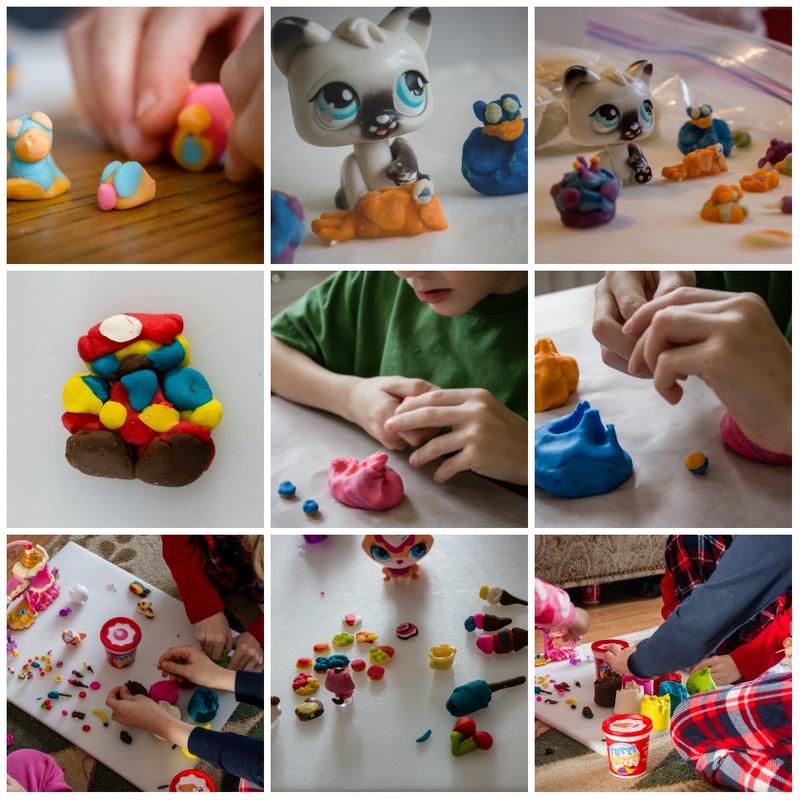 There really are a ton of benefits to play dough- not just Occupational Therapy! This is why it is a staple of early childhood classroom tools. Ignore anyone that suggests play dough is for preschool- I had the time of my life hanging out with the monsters and rolling dough, and I can't wait until we do it again! The artist in me is screaming THINK OF THE CREATIVITY! It is Rare Disease Day! In honour of this, I would like you to meet Owen- my 8 year old son. He has a rare genetic anomaly- specifically 11q23.3 (x4). Looks pretty technical when I type it like that! Here is a quick explanation of what it all means. Everyone has 23 pairs of chromosomes- these are the structures in each of the body’s cells that carry the genetic information (DNA) that tells the body how to develop and function. They come in pairs, one side inherited from each parent, and are numbered 1 to 23 approximately from largest to smallest. Each chromosome has a short (p) arm and a long (q) arm. Sometimes, there are errors within these chromosomes (missing genes (deletions), extra genes (duplications), genes that have ended up in the wrong spot or wrong chromosome, or structural differences like the arms being fused). All of which can effect how an individual develops. 1. 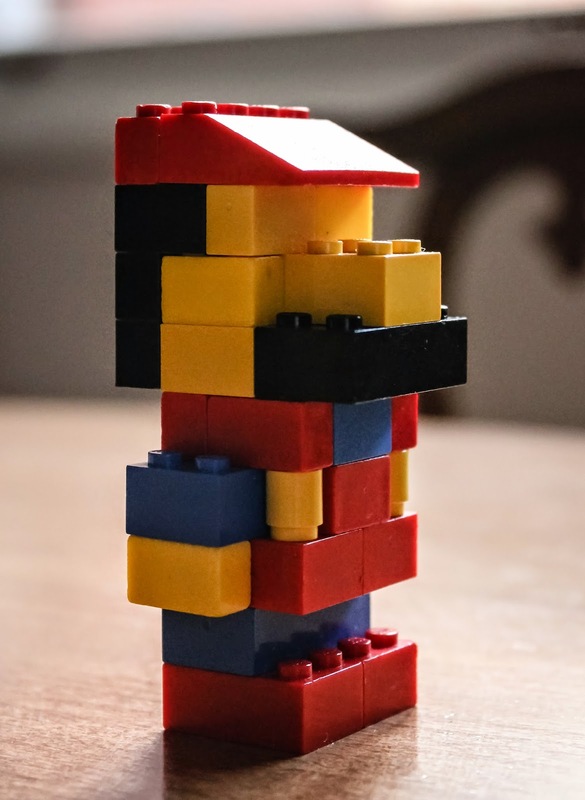 He has a small section of triplicated genes (meaning he carries 4 copies instead of the usual 2) on the (long) Q arm of the 11th chromosome- at the junction of 23.3. Deletions are by far the most common issues, followed by duplications (meaning 3 copies)- triplications (4 copies) are extremely rare. 2. The second part of the rare equation is that it is found on the 11th chromosome. It can be a lonely chromosome. So far, the only known person (in the world) that carries the same anomaly is Mr Cleverly Disguised as Cake. 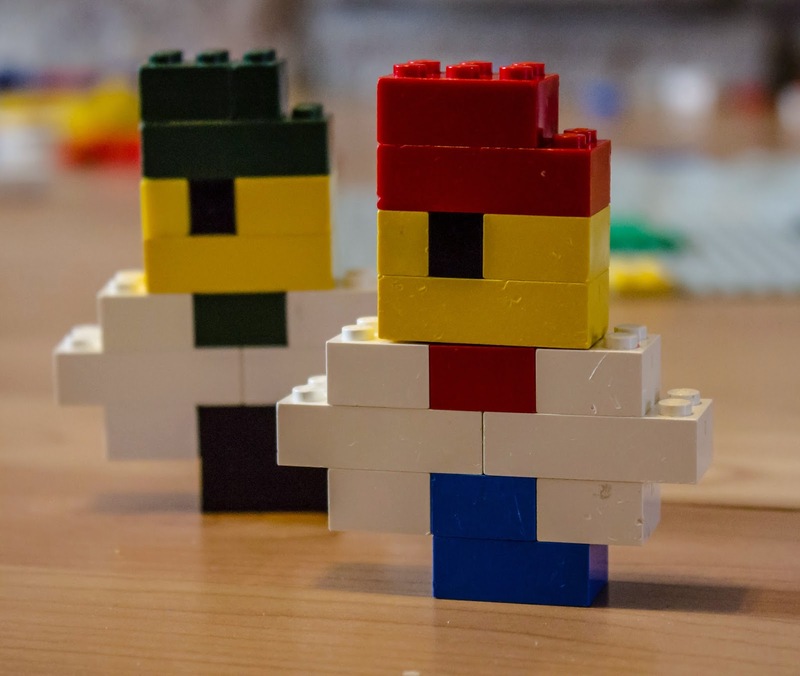 Sure, there are other known syndromes on the 11th chromosome (Jacobson's, Emanual, Neuroblastoma, Ewing's Sarcoma, Ectodermal Dysplasia type 4) but none are exactly what Owen has. 3.The third part you ask? He's freaking fantastic! He has a number of super powers- like hyperlexia (the ability to read before being taught- in Owen's case, he was spelling words on my fridge when he was 2- even though he didn't speak until he was 5) He has a deep understanding of empathy, and the brightest, happiest attitude I have ever encountered. He sees the world from a different angle than most- which often boggles my mind and makes me think that I need to look harder to see if I can catch those things that escape me. He is a computer whiz- no password is safe from his enquiring mind. Perhaps the coolest part? The unique and not often found ability to fall down, grin, brush off the dust and start all over...WITH A SMILE. 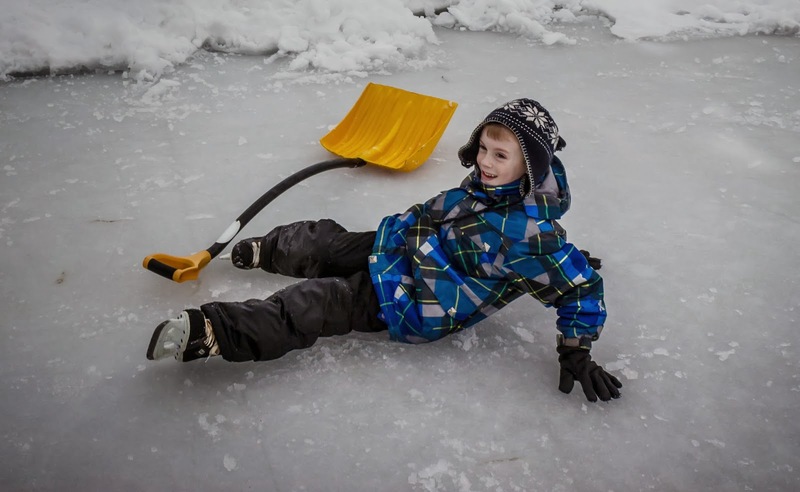 "It's pretty slippery out here Mommy!" He has his challenges. Feeding difficulties. Unique language. Hypomyelination in certain areas of the brain. 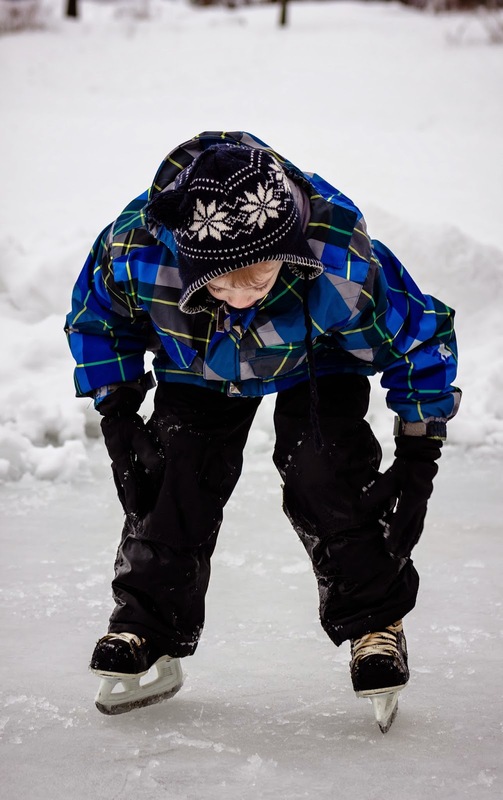 Motor planning, control and coordination difficulties. And while these things can be tough on a little guy that wants to be in the centre of the action, he takes it all in stride. Not much stops him from participating and enjoying in every moment of life. And that is something that I am eternally grateful for. He is not dis-abled, he is differently abled. Well, nobody really knows for sure. The one thing that I do know for sure? It is frightening to hear a specialist say "we don't know" in reference to your child. But it will not stop us from enjoying every moment of every day. Wife, poker-faced mother of three, amateur hacker, closet chef, maker of the best buttercream frosting on the planet, medical and veterinarian sleuth, Jenn is compelled to get to the bottom of things for others. Circus clown, astronaut, lover of small fuzzy animals, Vulcanologist. That's only part of her charm. Live long and prosper. All of this, while remaining cleverly disguised....as cake.